Mutuo is currently developing a Global Policy Guide for the International Co-operative Alliance. This will be a toolkit that can be used by the ICA and its members in their advocacy work on behalf of co-operative businesses worldwide. The Policy Guide will provide a keen communications narrative and crisp policy recommendations that can be taken forward at a Global, regional and national level by ICA members, regions and sectors. Detailed survey work of ICA members has already been carried out and presented to the ICA board in Bulgaria last month; these findings will inform the document’s final recommendations. We were delighted to receive 110 responses from across all regions from 47 different nation states. 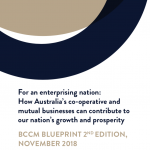 The document builds on Mutuo’s previous policy work in producing the ICMIF Global Manifesto and the Business Council for Co-operatives and Mutuals Policy Blueprint for an Enterprising Nation in Australia. The document will be completed and presented in draft at the ICA’s Global Conference in Kuala Lumpur in November 2017. So now we know what the EU negotiating position on Brexit will be. To be fair, anyone could have guessed it, but here on Planet UK we are expected to be surprised. The level of British self-delusion on the realities of this divorce are going to take some time to overcome. After all, the whole basis of the referendum was forged out of misinformation about the EU. People here will talk seriously about bendy bananas, benefit tourism and uncontrolled immigration, none of which are real things. The referendum campaign did little to illuminate the general public, with a strong media campaign reinforcing negative EU stereotypes and impossible promises for an ‘independent’ UK written on the side of buses. As Progressives we must take our share of responsibility for the lacklustre Remain campaign, but also for years of failing to counter the anti-European propaganda that is fed to the British public on a daily basis. All of this is well known among our friends in the EU. The question is how British Progressives should respond next. -We expect that EU citizens rights will be quickly agreed – this can be presented positively as the UK citizens in the EU will benefit equally. 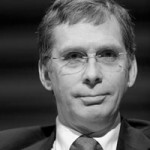 -The single financial settlement is much more problematic, as it is a key tenet on Planet UK that we ‘won’t pay a penny.’ The absurdity of this position will be laid out shortly as the list of commitments are identified, at which point the huge likely cost of 40-60 billion Euros needs to be accepted to move forward. -A ‘soft’ border with Ireland sounds ideal in principle, but will potentially produce an anomaly that makes a farce of leaving. Expect this to re-ignite long held animosities in Northern Ireland. -The location of EU agencies are to be in the EU. Expect UK media to scream about ‘punishing’ the UK. Louder if this extends to the Euro clearing system, which looks inevitable. -Ongoing jurisdiction for the European Court of Justice – this is guaranteed to make the arch-Brexiteers foam at the mouth. Expect a disproportionate and incoherent response from the UK. Progressives should urgently provide leadership, yet the Labour Party position since the referendum has been a disaster. Despite an unequivocal pro-European policy platform, and with most Labour voters and virtually every Labour MP supporting Remain, the Labour Parliamentary response to Brexit has been muddled, contradictory and ultimately self-harming. Labour proposed a number of amendments to the Bill enacting Article 50, including a unilateral guarantee of rights for EU citizens in the UK and crucially, a meaningful vote in Parliament on the final deal; all were defeated by the Conservative majority. Inexplicably, Labour then voted with the Government after the amendments failed, allowing the article 50 Bill to pass with a massive majority and feeding the folklore that there is a popular majority support for the UK Government’s idea of a hard Brexit. The logic was that Labour would pacify the Labour supporters of Leave, who it feared would desert them for UKIP or the Conservatives in Midlands and Northern Labour constituencies. More likely, their tactics in Parliament will instead have disillusioned ardent Remainers who are now considering lending their vote to the Liberal Democrats, who have been steadfast in their opposition to the Government’s position. This all adds to the serious challenge Labour faces in the General Election, and on current polling, is likely to face severe losses. So is there any chance of a Progressive response to Brexit? In many ways, one could say that this situation has to get worse before it can improve. Labour will inevitably be weakened by the election, but after that, it has the chance to take a principled stand against a hard Brexit, though its influence and power will be much diminished. In the meantime, former Prime Minister Tony Blair and others have called for voters to only support candidates (of any party) that have an open mind on the final deal for Brexit. This is unprecedented, and may have little effect on who is elected, but it may deliver a few more MPs who are prepared to insist on being able to intelligently consider a final deal before it is adopted. The fact is that sooner or later, the UK will have to face the realities of the divorce, and it remains to be seen how the public will respond to the cold, hard, truth of leaving. Mutuo has today launched new policy proposals to help make business work in the interests of ordinary citizens. The People’s Business report seeks to put cooperatives and mutuals – firms owned by customers and workers – at the heart of business policy and calls on progressive politicians to support and champion them. It is a positive response to the disillusionment felt by so many people who feel that economic and political systems only work for the vested interests of capitalist business, the wealthy and the powerful. Cooperatives and mutuals are the true people’s businesses – they generate profits to share amongst their customers and workers in the form of dividends or lower prices. This way of doing business benefits consumers, employees and European nations as a whole, providing diversity and choice in markets and sharing wealth more equitably. The report shows that the people’s business is already hugely significant – across Europe there are 130,000 cooperatives and mutuals which account for 1.3 trillion Euros in income every year and provide work for nearly 5 million Europeans. Yet their impact is uneven across the EU. Legislation, regulation and national policies often work to limit the opportunities for the people’s businesses to flourish. This report proposes a series of practical measures to increase the contribution of the People’s Business and help address some of these huge social and economic challenges. It offers a political vision for Progressive politicians seeking to re-connect with the people they wish to serve. Working with colleagues from the Foundation for European Progressive Studies (FEPS) the report launch represents the culmination of 18 months work which took us to all corners of the European Union to meet with sector experts, academics and policymakers. We examined powerful examples of where this approach to business benefits Europeans every day – for example through worker cooperatives in Spain and Italy or customer owned banks and insurers in France and food retailers and producers across Northern Europe. Some of Europe’s best known and most enduring businesses are cooperatives and mutuals – their resilience and longevity is testament to their relevance to the people they serve – the customers and workers of Europe. Mutuo has today launched the Mutual of Mutual and Cooperative Capital at the Quebec International Summit of Cooperatives. The project has launched after a year of close work with our partners, Charles Taylor PLC. Mutuals and cooperatives of all sizes need to raise capital. They also need to make secure investments to deliver returns. It is proposed to create MoMaCC as a new mutual to meet these needs. 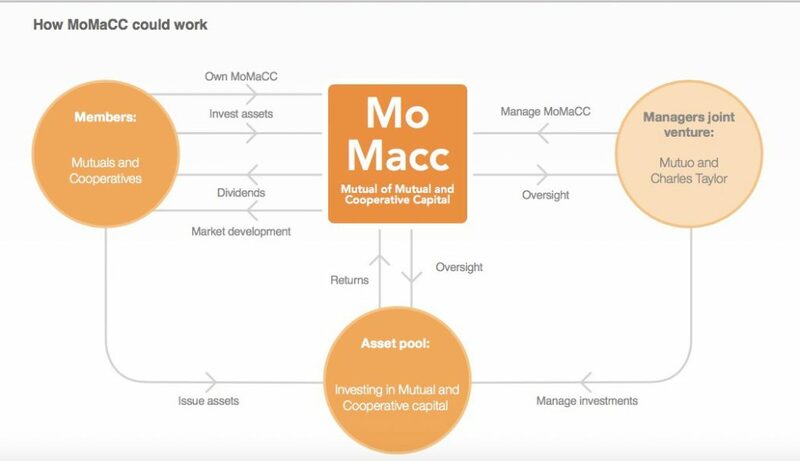 MoMaCC’s members and investors will themselves be mutuals and cooperatives. The board of directors will be drawn from the membership. It is believed to be the first time that mutuals and cooperatives will be able to securely raise capital through an institution that they collectively own and control. Who will create and manage MoMaCC? 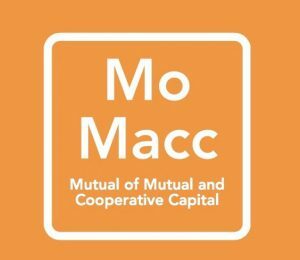 MoMaCC will be created by two businesses with a history of working with mutuals and cooperatives – Mutuo and Charles Taylor plc. Mutuo is an independent consultancy that works internationally with mutuals and cooperatives, particularly in relation to legislation and policy. Charles Taylor plc is a professional services provider which has managed mutuals for over 130 years. The Group currently manages four mutuals and advises a fifth. Mutuo and Charles Taylor are approaching a small number of leading mutuals and cooperatives to become the founding members of MoMaCC. Founding members will join the initial board of the mutual, controlling key decisions including quality control of membership, investment criteria and areas of operation. Longer term the membership of MoMaCC will be open to any cooperatives or mutuals that meet the due diligence and other quality criteria set by the board. The initial membership will focus on entities within the International Co-operative Alliance (ICA) top 300 plus other mutuals of similar standing. The International Summit of Co-operatives is the world’s leading event for business development in the co-operative and mutual community. It is being held later this year in Quebec City, October 11-13 2016. It offers managers, decision-makers and leaders of cooperative and mutual enterprises of all size and in all sectors, as well as anyone in the world of business, a unique venue for reflection, discussion, cooperation and training on major trends, as well as on current and future economic and financial issues. The Summit aims to promote and foster the development of co-operative enterprises in all countries. The event attracts more than 3,000 participants from 93 countries. The Nobel Prize winner and acclaimed economist Joseph Stiglitz has been announced as the keynote speaker at this year’s Summit. Also announced as speakers at the Summit are Mark R. Kramer, FSG co-founder and shared value advocate, and Robert Reich, influential economist and former Secretary of Labor under U.S. President Bill Clinton. For more information on the Summit, visit the website. Mutuo is working in a number of jurisdictions to help co-operative and mutual businesses to access new sources of capital. The UK Parliament approved the Mutuals’ Deferred Shares Act in 2015 and we continue to work with Government and regulators to ensure these new powers are implemented in a way that is of maximum use to mutuals. In many parts of the world co-operatives and mutuals face the same legislative impediments to capital raising as was the case in the UK. We are working with colleagues from Australia’s Business Council for Co-operatives and Mutuals to influence similar changes in Australian law. Last month the Australian Senate’s Economic References Committee recommended a series of reforms aimed at creating a better environment for co-operatives and mutuals. 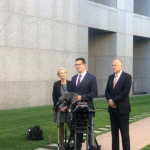 Importantly the Committee recommended amending the Australian Corporations Act to permit co-operatives and mutuals to access a broader range of capital raising opportunities. The Senate’s full report can be viewed here. Mutuo will work with our Australian colleagues throughout this year to help build this case for legislative change. If mutuals and co-operatives are to work in an environment where they can truly compete, then similar kinds of reforms will need to be considered by governments in other countries. Mutuo has completed the first phase of its European mutuals project entitled ‘The People’s Business.’ Working closely with our project partner, the Foundation for European Progressive Studies [FEPS], the project aims to demonstrate how cooperatives and mutuals can contribute to the future of the European economy and society. Over the course of the past few months Mutuo and FEPS have held symposiums in Brussels, Berlin, Copenhagen, Madrid, Sofia and Rome. We have learned a great deal both from the academic community as well as the cooperative and mutual business leaders who have joined our discussions. Europe is facing huge policy challenges be it from immigration, to integration, to economic inequality and the environment; what we believe is clear from our deliberations is that our sector can be an important part of the solution in many of these areas. We would like to sincerely thank all of those who have taken part in this phase. There will be a series of further Brussels based meetings before the report is ultimately published later in 2016. The objective for meeting was to discuss with the attendees the role of coops in facing current economic and social challenges. Mutuo has teamed up with FEPS (Foundation for European Progressive Studies) to undertake a new project which will chart the size and scope of the European co-operative and mutual sector and to examine the sector’s progressive foundations. Mutuo has joined the Foundation for European Progressive Studies [FEPS] and entered a new project partnership, which will show how cooperatives and mutuals can contribute to the future of European economy and society.